Dashboards pull customer support data from every area of your business and create powerful visual reporting tools. Dig deeper by using various widgets and interactive drill-down capabilities. See real-time performance metrics in a visually compelling way. Become aware of issues before they arise to your customers. Use goal-based metrics to keep your team on track and increase FCR rates. 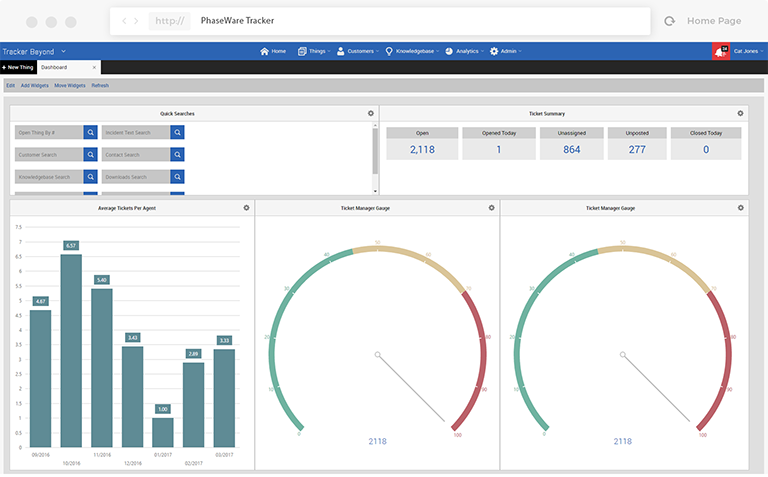 A dashboard gives a visual representation of support performance in real time so management can act as promptly as possible to various situations. Instead of, for example, seeing a report once a month showing how many SLAs were missed and which department had the most open incidents. With Dashboards you have the freedom to use various widgets. Using widgets allows each user to construct their dashboard to their particular needs. PhaseWare is ready to ensure that no feature is lost by providing key information on how to make the most of the widgets.